It's not something I plan, but somehow, whenever I'm in a new city, I find myself drawn to the unique beauty experiences it has to offer. One of the most memorable was the fish pedicure I got in Athens, where dozens of tiny fish ate the dead skin off my feet. I know it sounds gross, but my feet felt amazing afterwards. While that was a unique experience for me, such treatments can be found elsewhere, and I wanted to highlight some of the more unique places beauty lovers can visit when travelling, so here are my top sights for the beauty-loving tourist. Bite Beauty is a brand with a cult following, so you'd be forgiven for not knowing about it. Its products are available in Australia through Sephora, but I discovered it a few years ago when visiting the US. When I learned that the brand has a 'lip lab' in SoHo, New York, I knew I had to make time during my visit there to check it out. A lip lab is exactly what it sounds like. You have a consultation with a Lab Artist, discussing your ideal lipstick shade, and watch them mix it using the countless pigments they have available. Once that's done, you select the scent and finish of your ideal lipstick, and the artist mixes them in a centrifuge and pours the lipstick into a mold. The lipstick is then placed on a cooling table, which means it sets in about five minutes. I absolutely loved my visit to the Lip Lab – being able to watch as my ideal lipstick shade was made was such a unique experience, and Jackie, the Lab Artist who helped me, was such a delight. From there, you can do as I did and wander further into SoHo to visit the Birchbox store, where you can put together your very own Birchbox. I have a confession. Despite having written about beauty for most of my adult life, I have only had my eyebrows done by professionals once. In my defence, it was at the Anastasia Beverly Hills salon in Beverly Hills, so it's a hard act for any other salon to follow. If you like any of their products, whether it's the Brow Wiz or eyeshadow palettes or highlighters, the salon is a must visit. It's modestly sized, but has a lot crammed in – you can get absolutely any part of your body waxed, or get lashes applied, or even attend a one-on-one makeup lesson. My experience here was fantastic; my brows were done by Victoria, who had worked at the salon for over a decade, and she did a wonderful job. So wonderful that I don't want to see anyone else about my brows! If you love beauty, there's a good chance you love Sephora. But did you know it originated in France? I know, now we mostly hear about it from American consumers, but it first launched in Paris in the 1970s. While the store on the famous Champs Élysées was not the first Sephora store to open, it is the flagship store, and it apparently gets more visitors than the Eiffel Tower! If you're in Paris and you like to shop, you'll most likely find yourself strolling the Champs Élysées, and visiting the flagship Sephora store in the brand's home country is a must for any Sephora enthusiast. It's spacious, located in a gorgeous building, and the staff are wonderful. I had my first experience with nail wraps at this store, but somehow have not been able to duplicate the precise technique my beauty advisor used when applying them. While I have yet to visit this store myself, it is definitely on my list for my upcoming trip to Europe this July. It's their UK flagship, as well as the largest Lush store in the world, with three levels filled to the brim with customer favourites, as well as products unavailable anywhere else. The store also has a spa! Take your average spa treatment, add a dozen colours and scents to it, and that's what I imagine a Lush spa treatment would be like. I assume the finishing touch is to cover you in glitter using one of their glittery bubble bars, because that sounds perfect to me. Korean beauty is amazing. If you haven't tried any Korean brands, there's a good chance you've tried a westernised version of a Korean beauty innovation. BB creams? Korean. Cushion foundations? Korean. Foot masks? Korean. 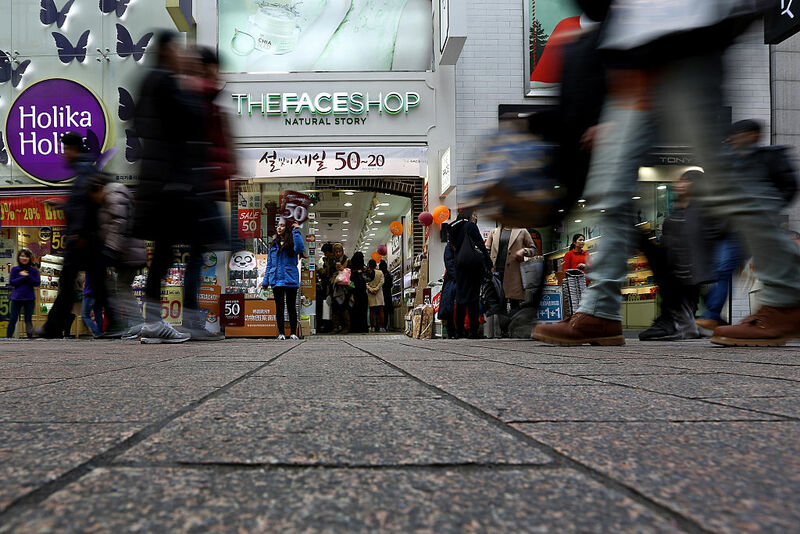 Myeongdong in Seoul is one of South Korea's premiere shopping destinations. Tragically, I haven't visited it myself, but when I saw the number of Korean beauty brands with stores there, I felt tempted to book a flight then and there. Brands like Etude House, Tony Moly, Missha, The Face Shop and Nature Republic all have stores near each other on this one busy street. Can you imagine?! No more waiting weeks for that Amazon delivery of snail extract face masks to arrive, Myeongdong can cater to all of your snail extract and bee venom needs. If you've spent a lot of time on Instagram, you're probably familiar with Ladurée's macarons and ornate boxes. But did you know they make beauty products as well as delicious treats? I didn't, until I started researching this article, and now it's a matter of great urgency that I find a way to acquire some. Unfortunately for me, the products are only available in Japan, Taiwan and Hong Kong, and three Sephora stores in France. One blogger described visiting a Les Merveilleuses store as like "being in Versailles, but more homey". The products are pricey, but by all accounts good quality, and made by the same team behind Anna Sui, which explains the unique packaging. They sell makeup, skin care, brushes, candles, and bath products, including some bizarre egg-shaped product with rose petals inside that is apparently a blush. As in, you stroke the petals with your brush, and apply the colour to your cheeks. Only in Japan. When thinking of places likely to have interesting beauty stores, Dubai's huge mall immediately came to mind. My instincts were correct, because I discovered the mall is home to a Hello Kitty Beauty Spa, the first Hello Kitty spa in the world. Personally, I'm still reeling from the news that Kitty is apparently a human and not a cat, but if she is, she does seem like the type to enjoy a pampering session every once in a while. Perhaps on a long layover, or in between shopping sessions? It seems to be a popular destination for children, which makes sense, but don't let them make you feel old. You can never be too old for Hello Kitty, or Hello Kitty themed things. The spa apparently only uses organic products, and has a café inside so you can eat a cupcake to restore your strength after an exhausting facial. While not everything in the spa is emblazoned with Kitty's face, there are Hello Kitty themed cushions, towels and lollipops. Otherwise, it just looks like an upmarket spa, with clear Japanese, French and local influences.